An amazing thing happened last night on my way to another ho-hum day. I attended another lecture in another city, and truthfully I didn't even know what the lecture was going to be about or who the speaker was, only that I'd committed to being there. It has been a blistering long week of meetings and administrative work and other boring things that writers never really talk about in the light of day. On my drive over, I realized I hadn't stocked up on business cards nor had I brought along my bag of books. Upon arrival, I frantically searched my car for any back ups, and found one copy of each book buried in my back seat under a pile of half-drunk Diet Dr Peppers, emergency snacks and a box of Kleenex. I was tired and overworked and the glow of compliments from my own presentation last month was beginning to fade. 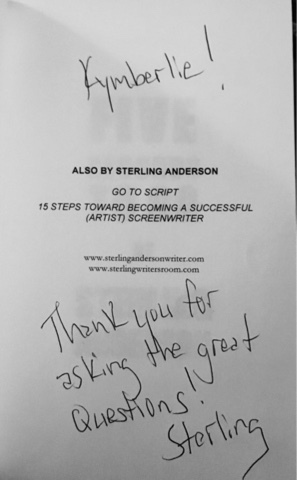 As I settled in to my seat and listened to the introduction of Mr. Sterling Anderson, an Emmy and NAACP award recipient among his awards for screenwriting and other works, I thought crap, I should have been better prepared! Because I always work better on my spurs, I immediately went to work using my favorite tool (my always-in-hand-phone) to research Mr. Anderson as he told his glory stories, explained what makes a standout scene and echoed my own instructional philosophies on various other elements such as the purpose of dialogue (a way for a character to be seen/heard and expressing what they want which propels the story forward). In just a few minutes, I knew that his work was being featured in an upcoming new television series, his nickname was Yoda, that his novel was one I wanted to read, his social media presence could use a little work, and that his Hollywood stories had merit. When the time came for Q&A, I pointed my questions in that direction and therefore put myself in direct line with the speaker before me. I was able to connect on a more personal level. The expression on Sterling's face was its own reward when I read aloud a passage from his novel and asked what had inspired it. Sometimes we need to take chances. One of my best pitches ever to a potential client was at another lecture and announced his project in progress to the audience and said he'd be looking for help, namely an editor. I promptly got on my tablet, looked up his website and jotted down a page of notes on what worked and what needed improvement. When I approached him later that evening, I lobbed a soft pitch for my services, asked how open was he to constructive criticism and at his invitation I handed over my notes. It's now a pending contract. As I stood in line last night to have Sterling sign the books I'd purchased (yes, including his novel), I kept cursing myself for not having business cards on hand. Before I could say anything to the man, he looked me in the eye and said "Thank you for those great questions!" I again said how much I appreciate the theme to his book of using our time wisely and curving with life's road, that it's something I write about a lot. "That's great, are your books available somewhere?" In my best think-fast voice, I said "Yes, they are. I also happen to have copies with me. Because, you know, every self-respecting author keeps their books in the trunk of their car." And that's how I put my books in the hands of an Emmy award winning professional screenwriter. Now, nothing more may ever come of it, but after having a lively conversation with him and his family as he asked me to sign both books, I felt an enormous sense of pride in myself. I'd taken a chance, struck up a conversation, found inspiration, made a connection, and now had something to show for it. If anything, this amazing story. Paying the bridge toll for the stranger behind me on my way to the lecture sure did pay me back in fortune. I am rich in the opportunities that have come my way through this writer's life. They might not be on a grand scale of things, but that's okay. It is a legacy that I'm proud to own.